If you have gratitude for your good life, then PAY it forward through our youths. Help us make youths positive role models, contributors to society and change agents for world and social change. Our Purple Youth survey reveals that the easiest people who fall prey to extremist ideologies, dangerous cults and bad company are YOUTHS who are naive, inexperienced, and easily influenced by the smooth-talking cult leaders. Extremists randomly approach strangers in online public forums, chat rooms, or even in shopping malls. We need to counteract this with our own CyberWarfare Purple Army. "It takes an Ex-BK to rescue a BK." To beat extremists, cultists, criminals, gangsters, bullies, we need to be conscious on how they think-speak-write-do-act-behave; and beat them in their own dangerous game. ​ArtScapes CSR is an Arts CSR to unite Youths & Veteran Arts Mentors to transform their Art forms into higher heroic & higher consciousness and cross-cultural consciousness. “Saving 72 Virgins” (SSTV) is Cult Awareness & Anti-Sexual Harassment Network of Cult Rescuers, family, and friends to help sexually harassed victims and cult members escape, house, and use cyberwarfare to stop the cancer spread in our community of Extremist Jihadist Cults (e.g. ISIS, Taliban, Boko Haram - kidnapping teenage girls), Religious Cults (e.g. Scientology, Brahma Kumaris), and Large Group Awareness Training (e.g. AsiaWorks, Landmark Education, Lifespring). Maybank current account name: ChangeU Group Sdn. Bhd. The more generous your contributions, the more Youth Projects can be initiated around the world. We want to start our Purple Army Communities around the world. EVERY CENT & USED EQUIPMENT COUNTS & MATTERS! Founder Robert Chaen has been funding various forms of these 3 CSR Initiatives and countless scholarships with his own money to the tune of way over US$100,000. You are supporting us to save Youths and Lives from Extremist groups like ISIS, Taliban, Boko Haram, religious fascists, doomsday Cults, depression, mental illnesses THROUGH creative arts, learning, awareness, entrepreneurship, and making Youths as good contributors of community - NOT becoming suicide killers, intolerant extremists, cultists who are all out to isolate their members and to break up families, or youths becoming depressed, lazy, corrupted, and unproductive only seeking for easy handouts. NOTE #1: A CSR-PR cheque presentation ceremony can be arranged. NOTE #2: NO Donation of clothes, cookery, cooked food, books, or broken equipment that needs repair. 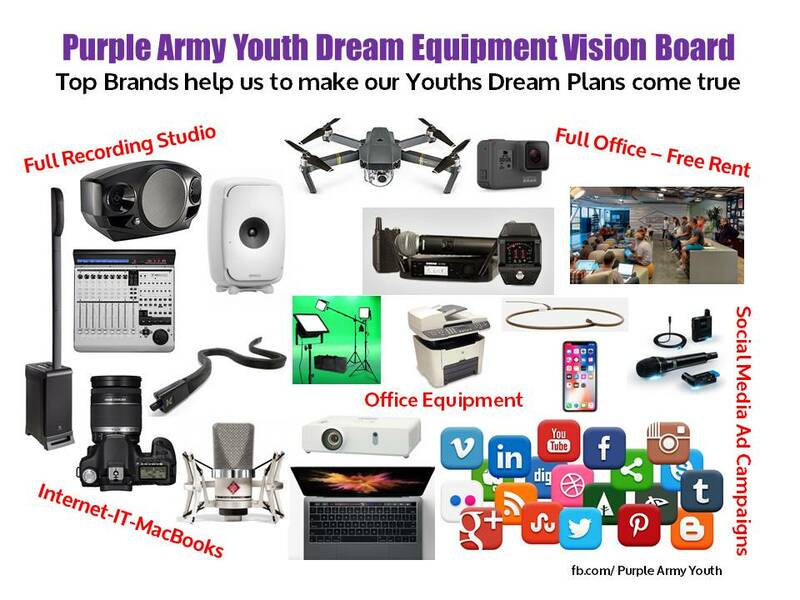 Public Appeal to Top BRANDS to help make our Purple Army Youths' dream plans come true. 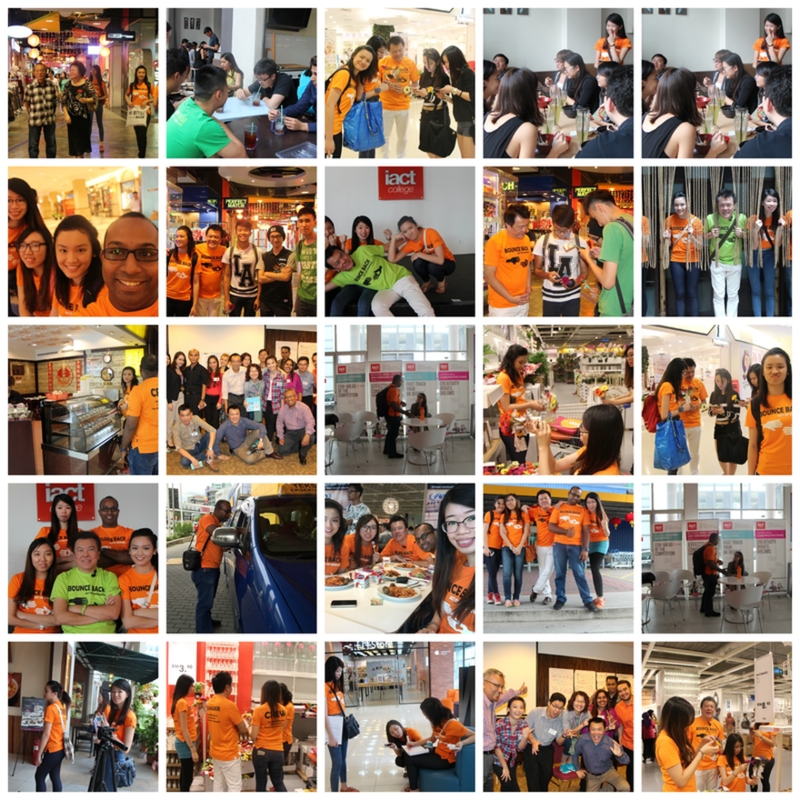 Usage of Top Brands will inspire Youths to contribute as role models and change agents. Many youths associate themselves with such progressive CSR-focused Brands like Apple, HP, Canon, GoPro and Sennheiser. ● 5 Youth Solutions: 1. Entrepreneurship 2. Curiosity (Learning) 3. Charity (Kindness) 4. Mental health 5. All forms of Arts. 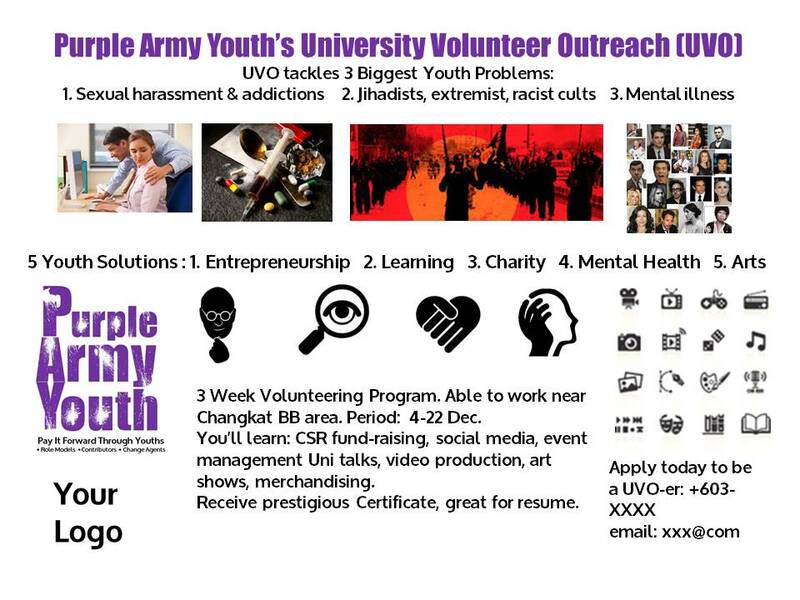 ● Certificate and Letter of Recommendation given jointly by ChangeU International-The Purple Army Youth. ● Crew T-shirts (depending on Corporate CSR Sponsors). 1. Promote, enroll and select 3 best under-graduates through lecturers or Student Council. UVO posters and bunting out. 3. Send to Purple Army Youth for final approval and confirmation with: 1) Photo 2) Field of Study 3) Time period and number of weeks duration of program.